We’d love your help. Let us know what’s wrong with this preview of Innovating Women by Vivek Wadhwa. From one of Time Magazine's "Forty Most Influential Minds in Technology” comes an essential collection of candid, first-hand accounts of women in technology. Women in technology are on the rise in both power and numbers, and now it's more important than ever to not lose that momentum, to "lean in" and close the gender gap. Although they make up half of the population, only From one of Time Magazine's "Forty Most Influential Minds in Technology” comes an essential collection of candid, first-hand accounts of women in technology. To ask other readers questions about Innovating Women, please sign up. What kind of impact will this book have on the world? I have read numerous business and subject books that are about women-- women using their innate perspective to create new products and companies, and books with practical advice about what women need to do to succeed. Each book presents some insight. But, no book I have ever read presents the commonality and universality of the experience women face as innovators, as founders, and as funders as the book, Innovating Women. Innovating Women is an exquisite compilation of personal and heartfelt acc I have read numerous business and subject books that are about women-- women using their innate perspective to create new products and companies, and books with practical advice about what women need to do to succeed. Each book presents some insight. But, no book I have ever read presents the commonality and universality of the experience women face as innovators, as founders, and as funders as the book, Innovating Women. Innovating Women is an exquisite compilation of personal and heartfelt accounts along side an insightful perspective that demonstrates that women who innovate in so many fields are many times unsung heroes yet are transforming the world we live in for the better. This book is about innovation, and an innovative process was used to create it. A lot of the content was crowd-sourced. I was one of hundreds of women who participated in telling our stories. My involvement might bias my review a little bit, but to be honest, I didn't know what to expect. Now, reading the book, I am blown away. The individual stories are moving and inspirational. It's very helpful to hear that other women struggled as much as I did with the male-dominated technology field, but w This book is about innovation, and an innovative process was used to create it. A lot of the content was crowd-sourced. I was one of hundreds of women who participated in telling our stories. My involvement might bias my review a little bit, but to be honest, I didn't know what to expect. Now, reading the book, I am blown away. The individual stories are moving and inspirational. It's very helpful to hear that other women struggled as much as I did with the male-dominated technology field, but we succeeded nonetheless with persistence and creativity. The extensive research and links to other articles keep the book from just being a feel-good book, though. The book discusses the dismal statistics regarding the shortage of women in technology and the research that explains how Silicon Valley became such a boys' club. In addition to the individual stories and research results, the authors also recruited numerous well-known female role models to tell their stories, including Google[X] VP and White House CTO Megan Smith, venture capitalist Heidi Roizen, and Anousheh Ansari, a serial entrepreneur and space explorer. By publishing a book that showcases the words and work of successful women in tech, the authors are helping women learn strategies to overcome artificial barriers. And by focusing on innovation, the book will help organizations learn how to benefit from the creativity and intelligence of all people, not just men. Most of the Western world imagines the lone male inventor when thinking about innovation. This image is a myth on two fronts: the lone inventor and the male. Vivek Wadhwa and Farai Chideya invited women innovators to crowd-create a book on women innovators, dispelling the myth of the “male” only innovator. And they’ve succeeded, fabulously. Innovating Women is a collection of stories – personal, powerful, inspiring, encouraging, disruptive, challenging stories - of women who grabbed the status qu Most of the Western world imagines the lone male inventor when thinking about innovation. This image is a myth on two fronts: the lone inventor and the male. Vivek Wadhwa and Farai Chideya invited women innovators to crowd-create a book on women innovators, dispelling the myth of the “male” only innovator. And they’ve succeeded, fabulously. Innovating Women is a collection of stories – personal, powerful, inspiring, encouraging, disruptive, challenging stories - of women who grabbed the status quo by the horns and threw it aside. [In full disclosure, I have a story in the book]. The stories include women from all over the world, in diverse sectors of STEM, like technology, investing, engineering, medicine, biology, as well as STEAM. The stories, including one by America’s new CTO and former VP at Google[X] Megan Smith, represent the authentic voices of women who have persevered, overcome, created, and innovated their careers and accomplishments. Both women and men will learn from these innovators’ experiences and insights and apply them when fighting stereotypes, stigmas and artificial distinctions. Companies and organizations will see how diversity of thought, experience, background and gender are critical for innovation and therefore success. Innovating Women is a Must Read for women, men, girls, boys, teachers, leaders, managers, politicians, everyone. Read it, share it, discover and enable more stories so we can unleash the talent needed to solve the wicked problems facing our world. Keep the stories coming. I began reading Innovating Women on a cross-country plane ride and 4.5 hours later still couldn’t put it down. Vivek Wadhwa and Farai Chideya have done a phenomenal job of highlighting the inspiring stories of women of all ages and ethnicities across the globe. While the nexus of all these stories is life in the tech sector, each has a different focus – investing/funding, entrepreneurship, work/life trade-offs, etc. Situated between each story are smaller vignettes nudged against statistics and I began reading Innovating Women on a cross-country plane ride and 4.5 hours later still couldn’t put it down. Vivek Wadhwa and Farai Chideya have done a phenomenal job of highlighting the inspiring stories of women of all ages and ethnicities across the globe. While the nexus of all these stories is life in the tech sector, each has a different focus – investing/funding, entrepreneurship, work/life trade-offs, etc. Situated between each story are smaller vignettes nudged against statistics and historical information that provide context for the trends we see around us today. There are a growing number of articles and books about women in technology, but none of them provide as wide and varied a perspective as this one does. The book’s creation is itself an innovation; Wadhwa and Chideya built much of it by crowdsourcing stories, research ideas and potential interviewees. I was fortunate enough to find a request for participation early on and commented to a number of my colleagues about the collaborative, thoughtful and inspiring discussions I was having and reading about with other women. The book captures the spirit of the organic and lively exchanges from the crowdsourcing platform. Whether or not you are a woman in tech and science, or not even a woman at all, you’ll find stories that resonate with you, that speak to your experience and to that of your peers. If you’re just getting started, read this for inspiration and also for the practical advice that can help you in your career. When I first met Vivek he had just produced his seminal research on the dearth of women in Silicon Valley that his wife’s keen observation at TechCrunch had spurred. The Anatomy of an Entrepreneur, published in November 2009, served as critical validation for much of what we intuitively knew and had already implemented at Astia. The reality that Vivek uncovered is profound and serves as critical myth busting: that women high growth entrepreneurs are more like their male counterparts than differe When I first met Vivek he had just produced his seminal research on the dearth of women in Silicon Valley that his wife’s keen observation at TechCrunch had spurred. The Anatomy of an Entrepreneur, published in November 2009, served as critical validation for much of what we intuitively knew and had already implemented at Astia. The reality that Vivek uncovered is profound and serves as critical myth busting: that women high growth entrepreneurs are more like their male counterparts than different. Armed with this understanding, Astia is about fixing the ecosystem, rather than fixing the women. Our goal during our 15 years has been to change the way our ecosystem looks at and evaluates high potential organizations. We stand with the contributors of "Innovating Women" when we say, we want more recognition of and investment in a super potential and high performing group of entrepreneurs – women entrepreneurs. We see women leaders as integral participants in inclusive, high performing entrepreneurial teams — without them, success is more difficult. "Innovating Women" brings voice to this and many other entrepreneurial truths. It is a must read for the innovation economy - an economy in desperate need of innovation. What an amazing book! I was a crowdsource contributor to this project, and it's wonderful to see the end result. The stories are from women all over the world, and not just Silicon Valley, so it's great to see a multiplicity of voices here. The writing is terrific. I wasn't sure how the authors would pull all of these different perspectives together, but the text they produced is powerful. The stories are inspirational. There are lessons here for all of us - both men and women, anyone who cares a What an amazing book! I was a crowdsource contributor to this project, and it's wonderful to see the end result. The stories are from women all over the world, and not just Silicon Valley, so it's great to see a multiplicity of voices here. An awesome job! So glad I was part of the development and so inspiring! It offers women great advice on how and where to get funding for their start ups. I can't wait for the inspiration this book will bring. This is a crowdsourced book and it shows. I wanted to love it enough to give it five stars, but I had some issues with how it was put together. I do want to say that the stories in this book are great. I enjoyed reading about women who have succeeded in diverse corners of the tech industry, who can serve as role models for girls and women who want to do the same. I was already familiar with many of the stories and statistics because I make an effort to stay on top of them in the news and on twitt This is a crowdsourced book and it shows. I wanted to love it enough to give it five stars, but I had some issues with how it was put together. I do want to say that the stories in this book are great. I enjoyed reading about women who have succeeded in diverse corners of the tech industry, who can serve as role models for girls and women who want to do the same. I was already familiar with many of the stories and statistics because I make an effort to stay on top of them in the news and on twitter. I thought the book did have the "breadth" it needed, and I did still learn a lot. What I had hoped for was a more cohesive overarching storyline to pull it all together. I remember reading "Half the Sky" by Nicholas Kristof and Sheryl WuDunn and being really drawn in by the overall story and purpose of the book. "Innovating Women" could have been that, but probably because of the crowdsourcing of the writing, felt like it went all over the place and didn't quite all pull together. There were also points in the story that felt a bit like "inside baseball", meaning that it felt like it was written for people already well-versed in the terminology and structure of the tech and entrepreneurship industries, and I worry that it might not be totally accessible for women looking to get into tech for the first time. However, having pointed out what disappointed me, I will say that this is a valuable collection of stories that needed to be documented and shared. It is good coverage of the "state of the system", while also being inspirational by showcasing women that have "defied the odds" and pointing out where improvements can be made. I think rather than a book, I see Innovating Women as being presented more like a magazine: tidbits of stats here, profiles of success there, essays of obstacles that had to be overcome, etc. Not in a "chicken soup for the soul" style, but in more of a "collection of blog posts" style. I may come back later and edit this review with more specifics, but having just finished the book, I wanted to write something up while the "feeling" of it was still on my mind. I'm really not sure who the intended audience for this book is. I've been an engineer in Silicon Valley for 30 years, but I'm not it. (1) This is like me reading a book about tying my shoes and since I've been trying my shoes by myself for a bit, you're going to have to bring something new to the topic. And they didn't. Most of the essays in this book were very superficial. (2) I interpret women in technology as engineers and scientists working with technology. This book focuses on investors and I'm really not sure who the intended audience for this book is. I've been an engineer in Silicon Valley for 30 years, but I'm not it. (1) This is like me reading a book about tying my shoes and since I've been trying my shoes by myself for a bit, you're going to have to bring something new to the topic. And they didn't. Most of the essays in this book were very superficial. (2) I interpret women in technology as engineers and scientists working with technology. This book focuses on investors and venture capitalists, who are very smart business people, but most of them have never slept under their desks to get a product out the door. Vivek Wadhwa & Farai Chideya exquisitely stitch together the thread of common stories of women in technology – revealing common struggles, barriers and obstacles. Their book is impeccably worded and authentic to the unique voices and experiences of outstanding female leaders. I found the stories relevant, relatable and on-point to situations I have encountered in my career as an engineer and manager in technology companies. 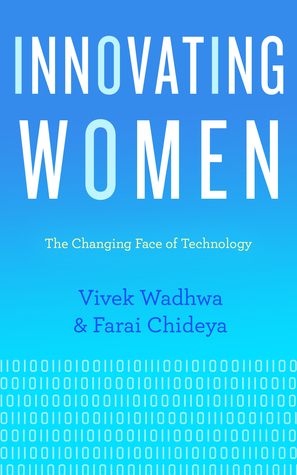 Wadhwa and Chideya include outstanding recommendations for steps for Vivek Wadhwa & Farai Chideya exquisitely stitch together the thread of common stories of women in technology – revealing common struggles, barriers and obstacles. Their book is impeccably worded and authentic to the unique voices and experiences of outstanding female leaders. I found the stories relevant, relatable and on-point to situations I have encountered in my career as an engineer and manager in technology companies. Wadhwa and Chideya include outstanding recommendations for steps forward – making this a must-read for anyone working in technology, or heck, anyone hoping to change the world for the better. I won a copy of this in a First Reads Drawing. This is the first won book that I can't get through. I've been trying for a month to read it, but I can't get any farther than 30 pages in before I die of boredom and forget what it's even supposed to be about. It's supposed to be a collection of essays by women with regards to innovation and technology, but the principal author is a MALE. He writes the introduction and I feel like he's condescending and racist. I also get the feeling that many of th I won a copy of this in a First Reads Drawing. Interesting book that had helpful ideas that could also be applied to other fields. I particularly enjoyed the essays by successful women in technology interspersed throughout the book. I found the stories by Kim Polese, Heidi Roizen, Mary Grove and Megan Smith especially inspiring. And I loved the advice from Liddy Karter, who wrote, "the next time your six foot four, square-jawed, broad shouldered colleague restates what you just said and everyone nods approvingly after looking bored when you spoke, just thank him for agreeing with you." Oh yes. I can't wait to put that into practice. I was surprised that the book encompassed much more than just women in technology (since it w I found the stories by Kim Polese, Heidi Roizen, Mary Grove and Megan Smith especially inspiring. And I loved the advice from Liddy Karter, who wrote, "the next time your six foot four, square-jawed, broad shouldered colleague restates what you just said and everyone nods approvingly after looking bored when you spoke, just thank him for agreeing with you." Oh yes. I can't wait to put that into practice. I was surprised that the book encompassed much more than just women in technology (since it was billed as a collection of candid, first-hand accounts of women in technology). There were many stories from women not in the tech field, including an entrepreneur in a Mexican village making energy drinks, an editor for financial news sites, a Wall Street broker, and a medical doctor. There was data about women-owned businesses (not just tech companies). There was a chapter about entrepreneurship in general, but it wasn't specific to tech entrepreneurship. While I would have loved to see more focus on the tech industry, I'm sure many readers will appreciate the broader focus. Innovating Women: The Changing Face of Technology by Vivek Wadhwa and Farai Chideya A collection of essays on everything that comes with being a woman in tech and entrepreneurship, Innovating Women paints a progressing and bright future for women, the tech industry and entrepreneurs. The essays cover all sorts of topics within this realm such as sexual harassment, internal biases, advice for women coming into the industry and advice for companies looking to diversify. The essays come from a dive Innovating Women: The Changing Face of Technology by Vivek Wadhwa and Farai Chideya A collection of essays on everything that comes with being a woman in tech and entrepreneurship, Innovating Women paints a progressing and bright future for women, the tech industry and entrepreneurs. The essays cover all sorts of topics within this realm such as sexual harassment, internal biases, advice for women coming into the industry and advice for companies looking to diversify. The essays come from a diverse sampling of women from all kinds of backgrounds and from multiple countries. This was a great book that had a lot of insight, I was surprised by the array of topics covered and advice shared from these diverse women. While it does spend time talking directly to companies, it focuses on women and the things we do and the ways we break into industries and stay or don't stay. It talks about what we're doing right now and how we can improve things for ourselves, each other and the companies we work for and that we don't have to stay at companies that don't appreciate us. A truly inspiring read for anyone in STEM fields. This book highlights some of the accomplishments of women in various fields and the structure of a crowdfunded/sourced book bringing together many stories from across the world works well. It's also great to be able to read about how various well-known organizations like the Ada Initiative and Women2.0 came about. It gives direction and advice through stories from successful women about various topics from harassment and discrimination, to being s A truly inspiring read for anyone in STEM fields. This book highlights some of the accomplishments of women in various fields and the structure of a crowdfunded/sourced book bringing together many stories from across the world works well. It's also great to be able to read about how various well-known organizations like the Ada Initiative and Women2.0 came about. It gives direction and advice through stories from successful women about various topics from harassment and discrimination, to being successful while having a family, from entrepreneurship to projects aimed at social change on a large scale. My one slight disappointment is that it was largely focused on stories from women living and working in the US, although there were a few exceptions. This is a crowd sourced book and it shows it. Vivek is truly an awe inspiring man and the work that he and his team has done to bring forth Innovating Women to us is worthy of every award and accolade. I am blown away by the incredible courage that the women featured in this book have shown. It is not easy to step forward and tell one's story; the women should be commanded. This book captures all essence of the dozens of one-on-one conversations that I have had for years with the many women that This is a crowd sourced book and it shows it. Vivek is truly an awe inspiring man and the work that he and his team has done to bring forth Innovating Women to us is worthy of every award and accolade. I am blown away by the incredible courage that the women featured in this book have shown. It is not easy to step forward and tell one's story; the women should be commanded. This book captures all essence of the dozens of one-on-one conversations that I have had for years with the many women that I have worked with in the tech industry. This is a must read for men and women who want to change the tech industry and create a level playing field. The many compelling stories of the global women teaches us that we can thrive despite set backs and harsh challenges. There is an underlying message that we can change the tech cultural if we all work together and speak up when the situation warrants it. Didn't like the book at all. It interpets information in a way that promotes it's main idea. It's not a secret that women today seem to achieve way less than men. The book tries to proves this wrong, and while I wish it was right, I believe they were using misleading statistics to make it look real. Yes, there's sexism and yes it's harder as a woman today, no doubt about it, but I honestly think women can do better than they currently perform. I wish we'd see more female innovators in the near futu Didn't like the book at all. It interpets information in a way that promotes it's main idea. This lively collaboration features rock stars who have paved the way for women in tech. While many achievements have been accomplished, the situation is still dire. As Winston Churchill said - "If you're going through hell, keep going." The battle goes on but slowly women are figuring out how to play the game and many men are beginning to support and advocate for them. Personally I believe it's a shame that Wadhwa was bullied off the stage by the same people he was trying to help. We need more p This lively collaboration features rock stars who have paved the way for women in tech. While many achievements have been accomplished, the situation is still dire. As Winston Churchill said - "If you're going through hell, keep going." The battle goes on but slowly women are figuring out how to play the game and many men are beginning to support and advocate for them. Personally I believe it's a shame that Wadhwa was bullied off the stage by the same people he was trying to help. We need more people talking about these issues- not fewer. A must read for anyone interested in improving innovation, here is a direct and unfortunately not often enough employed strategy - seek out bright women and allow them the flexibility to engage. We saw the wonders of this strategy in 1940's with Rosie the Riveter. Today, we need a new galvanizing image and Wadhwa and Chideya have given us a plethora to choose from. This book has multiple success stories of women who have made it big in the technology industry. Some are really inspiring. The book highlights some action plans to overcome unbalanced gender ratio in the technology Industry. I won a free copy from the Goodreads First Reads Giveaway Program and think that it interesting and beneficial. I would recommend it to everyone.